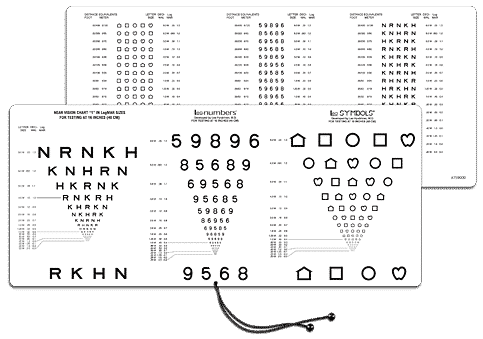 3 in 1 Near Visual Acuity Test contains 3 different optotypes in one easy to use chart; LEA SYMBOLS, LEA NUMBERS, and Sloan Letters. The near vision card contains lines with proportionally spaced (logMAR) optotypes in ETDRS format; line sizes range from 20/400 to 20/10 (6/120 to 6/3) equivalent. Attached 16-inch (40 cm) measuring cord ensures proper screening distance. The reverse side is printed the answers for the near vision test allowing to easily follow with the patient.